Changes to a key protein amplified its natural ability to counter kidney disease, according to a study published today by researchers at the University of Alabama at Birmingham School of Medicine in the journal Nature Medicine. When healthy, the kidneys filter blood, divert waste into urine and return useful proteins to the bloodstream. Diabetes, high blood pressure and cancer damage the kidneys; but nothing hastens kidney failure like proteinuria, where proteins get past damaged filters, enter the urine and cause scarring in the tubules carrying it. In the current study, researchers demonstrated for the first time that the body tries to counter proteinuria by making more of a protein called Angiopoietin-like 4 or Angptl4, but that a second pathway interferes. Specifically, Angptl4 takes part in two competing feedback loops: one in which worsening proteinuria triggers greater Angptl4 production, and a second where rising Angptl4 levels soon shut down Angptl4 production. The second loop restrains the first, which may explain why people with severe proteinuria make just three times as much Angptl4 as people with healthy kidneys, instead of 30 times as much. Based on their new understanding, the team engineered a version of Angptl4 that still counters proteinuria, but can no longer engage the pathway where it slows its own production. When injected into rats bred to serve as models of human kidney diseases, the mutant protein, freed of its normal constraints, reduced proteinuria by 60 percent. In 2010, kidney failure caused 91,000 deaths, with another 179,000 people living with kidney transplants and 415,000 more on dialysis. 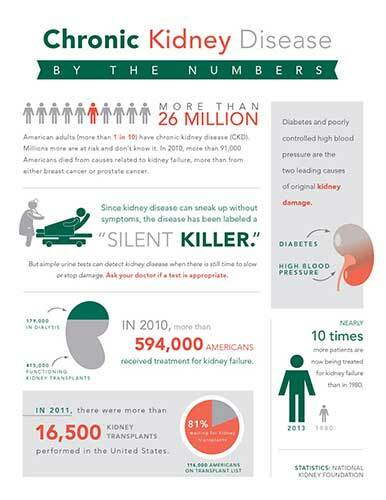 Nearly 10 times as many patients are now treated for kidney failure as were in 1980, with the “silence” surrounding the epidemic explained by the disease’s lack of symptoms until severe and the inability of available drugs to prevent kidney failure. There is also currently no treatment designed to counter proteinuria. In a five-year effort, Chugh’s team engineered four new proteins and studied nine rat and mouse models for the current study. Careful comparisons of the models confirmed that Angptl4 levels rise in response to proteinuria, that it participates in the two feedback loops and that the mutated protein has therapeutic effects in glomerular diseases. Some of the study mechanisms were then confirmed in studies of human blood and urine. Specifically, the researchers found that circulating Angptl4 counters proteinuria by interacting with a protein called αvβ5 integrin inside blood vessels in kidney filters. Exactly how it does so is still under investigation, but it may involve chain reactions started by Angptl4 that make cell layers separating blood and urine less permeable to proteins. Whatever the case, mice engineered to lack either this integrin or Angptl4 do not recover well from proteinuria. Meanwhile, Angptl4 was also found to participate in a feedback loop underway locally in skeletal muscle, heart muscle and in the adipose tissue that stores fat. Here it prevents the enzyme lipoprotein lipase from breaking up fats called triglycerides into free fatty acids, rising levels of which would otherwise promote Angptl4 production. This explains for the first time the high triglyceride levels seen in patients with severe kidney disease. Regardless of its role in lipid regulation, the relevant effect is that naturally occurring Angptl4 slows its own production by these organs, and in doing so, works against efforts by the systemic, integrin-based pathway to reduce proteinuria. Chugh’s team used standard molecular biology techniques to change the structure of Angptl4 and uncouple its two feedback loops. First, they switched out key amino acid building blocks at key spots in the chain of molecules making up Angptl4 at either position 39 or position 40. These changes were chosen because past human studies had shown that, when they occur randomly, people with these variations have very low blood-triglyceride levels. That’s because they have a version of Angptl4 that can neither keep lipoprotein lipase from breaking down triglycerides nor interact with the self-limiting Angptl4 loop in any way. This is the change that brought about the steep drop in proteinuria seen in the current study. The second change to Angptl4 corrected for the protein’s tendency to break into two pieces when circulating in the blood. Smaller protein fragments are more likely to get past damaged kidney filters and be lost in the urine, a poor feature in a protein meant to treat proteinuria. By altering the Angptl4 cleavage region, the team made it less likely that the protein would break up. Looking forward, Chugh’s team has applied for a grant from the National Institutes of Health that if funded would seek to confirm that reducing proteinuria with mutant proteins also significantly slows chronic kidney disease. The team also plans to conduct the toxicity and dosing studies that would need to succeed before they could apply for permission to begin human clinical trials. Along with Chugh, UAB study authors included Lionel Clement, Ph.D., and Camille Macé, Ph.D., of the Glomerular Disease Therapeutics Laboratory. Also making major contributions were Carmen Avila-Casado, M.D., Ph.D., of the Department of Pathology at Toronto General Hospital and the Department of Pathology at Instituto Nacional De Cardiología in Mexico City; Jaap Joles, DVM, Ph.D., of the Department of Nephrology and Hypertension at the University Medical Center Utrecht in The Netherlands; and Sander Kersten, Ph.D., of the Nutrition, Metabolism and Genomics group at Wageningen University, also in The Netherlands. The work was supported by several NIH grants (R01DK077073, R01DK090035, K01DK096127 and T32DK007545). Related patent applications have been filed worldwide by the UAB Research Foundation.